No.117 & 119, Ground Floor, Jalan Perniagaan Gemilang 1, Pusat Perniagaan Gemilang, 14000 Bukit Mertajam. Penang. Passengers can directly buy a voucher at the taxi counter in the terminal building and then present the voucher at the taxi tank outside. From Airport, proceed to Penang bridge signboards. When comes to end of Penang bridge, go straight and follow the Butterworth signboards until come to a roundabout. At the roundabout, turn to your 9 O'clock. Trun left after your passed by Petronas petrol station and go straight. Turn left and you may found Sunway Hotel just on your left. 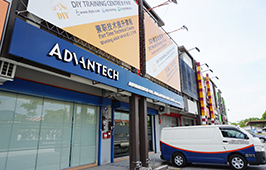 Advantech Penang Office just located at shop lot behind the hotel.